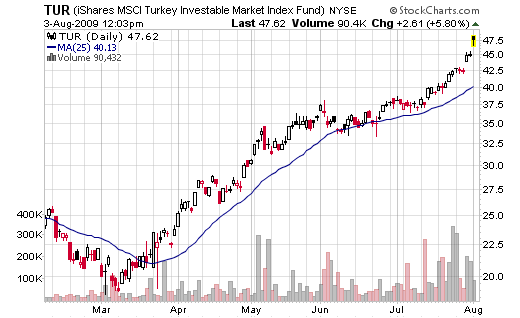 The best ETF for this month is TUR (iShares MSCI Turkey). Turkish market, like any other emerging market, was down almost 70% from October 2007 to November 2008 and is recovering very well right now. How far it can go? It all depends on the overall market. If the actual optimism will continue the Turkish market will likely outperform the US and other developed countries markets but the opposite is also true, if the last year pessimism will return. Is it still time to buy TUR today? Click here to find out. Turkey has rised its time to sell. Financials are recovering XLF will have more upside.